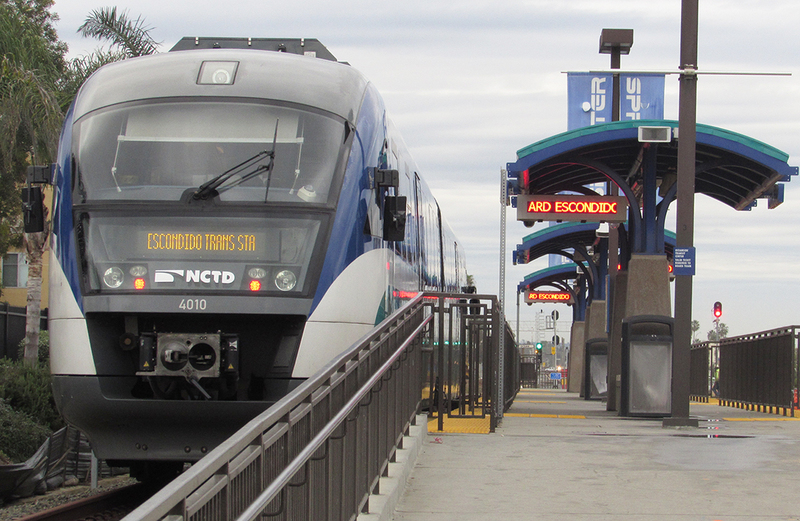 OCEANSIDE — The North County Transit District (NCTD) is under fire amid a series of allegations of racism, sexual harassment and male employees using video cameras to zoom in on female passengers breasts and bodies. Noel Buckhanon was the only black female code enforcement officer at NCTD when she was hired in 2014. Earlier this year, Buckhanon filed a civil suit against the transit organization after more than one year on the job, for the allegations stated above. The suit was filed on Oct. 31, but she’s since taken a medical leave of absence due to stress from the job, according to her Carlsbad-based attorney Laura Farris. 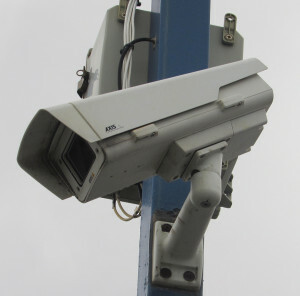 North County Transit District employees are accused of using security cameras to zoom in on women’s breasts and buttocks. Farris, whose practice centers on employment law, said NCTD was notified in January of a potential suit and given time to address those issues with employees. However, Farris said no official action had been taken by the agency, so the lawsuit was filed. A jury trial was requested. NCTD released a statement on Tuesday after the story broke. NCTD did not address the alleged racial and discriminatory comments made toward Buckhanon in the statement. The statement said NCTD wouldn’t comment further due to the pending lawsuit. According to the suit, cameras zoomed in on passengers’ cellphones, read text messages and focused on women’s breasts and buttocks. Male employees also made unsavory comments about young girls attending a Taylor Swift concert on Aug. 29, 2015, the suit alleges. In addition, only men were allowed to work on July 16, 2015, the opening day for the Del Mar Racetrack. If a woman was over 24, some male employees said they were “cute,” but the ones over 24 had “aged out” and would not be given assistance. NCTD’s statement concluded, “NCTD values the privacy of our customers and fully expects our employees to engage with the public in a professional and respectful manner. NCTD provides training for all employees related to its Code of Conduct and prohibition of harassment in the workplace. To the degree any employee engages in any activity outside of NCTD’s expectations for professional conduct, the employee will be subject to disciplinary action. The suit alleges abuse toward Buckhanon shortly after her hiring in August 2014. 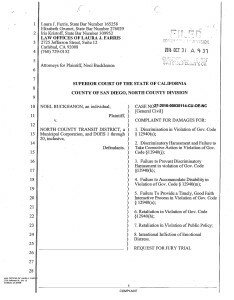 Click on the image to read the lawsuit filed by Noel Buckhanon against the North County Transit District alleging racism, sexual harassment and other workplace infractions. Greg Gotto, Buckhanon’s first supervisor, allegedly refused to supply her with the necessary tools and equipment to perform her duties, including a badge, which is standard for all code enforcement officers, Farris said. Buckhanon was also not issued a citation notebook until three months after being hired, while male code enforcement officers were issued books within two days of employment. The suit also said Buckhanon was denied cross training and given less desirable assignments, while non-black and female employees were not subjected to such action. In addition, she was not allowed to work overtime, while her colleagues were. Farris said employees also used the “n-word” numerous times around and to Buckhanon. Another male employee complained about his wife’s action of forbidding him from using racial slurs in their home. In addition to Gotto, Buckhanon’s suit alleges her second supervisor, William Farlow, was also present when numerous discriminatory and vulgar comments were made toward Buckhanon. She also alleges she and other employees were denied rest and lunch breaks for nearly one year. Buckhanon filed a complaint with Human Resources, but was still denied. In August 2015, a “lunch log” was implemented by the NCTD to document meals even though none had been afforded to employees. Buckhanon submitted to falsifying her meals in fear of retaliation. 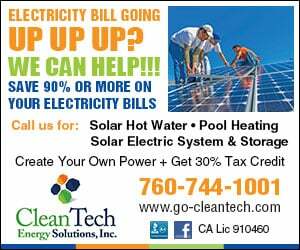 Buckhanon was assigned to the Oceanside transit center and was kept there for eight months despite requesting code enforcement duties. The suit also alleges NCTD does not train code enforcement officers on safety issues, as Buckhanon said she was scared working alone at night due to a large transient population close to the center. In addition, she was also assaulted by passengers on the train, but had no training to prepare for threats. On May 9, 2015, Buckhanon was abused by a passenger and spit on and even the conductor could not calm the passenger down. The passenger even pulled out a toy gun and pointed it at her. Her report to Farlow was met with indifference and no medical evaluation, such as a Hepatitis C test, was conducted. However, two other employees who were spit on later in the year were given the medical tests. Later in the month, Robert Keetch was hired as the new Code Enforcement Office manager. Initially, he was shocked to hear about Buckhanon’s recount of the event, but Buckhanon didn’t receive any updates from Keetch after providing him the incident report. She also reported workplace safety concerns to Human Resources Manager Rose Jean-Paul, but NCTD did not act, the suit claims. Buckhanon was also denied a $2-per-hour raise given to employees released from their one-year probation period. She was kept on probation after Gotto allegedly said Buckhanon must complete additional training, although no other employees in the same situation were required to do so. The suit asks for a judgment to cover past and future lost wages and benefits, general damages, medical expenses, punitive damages, attorney’s fees, cost of the suit and other money a jury determines proper. Farris said it takes about 18 months from the filing date to schedule a trial date.